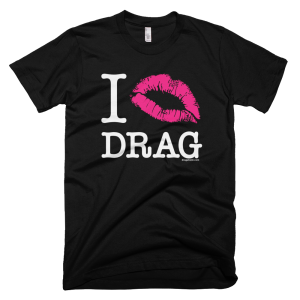 Limited Edition Pink & Black ‘I Lips Drag’ Tee Now Available! We’re so excited to announce our first ever limited edition tee for the Dragaholic Store! We were so shocked by the positive response we got when we announced our classic ‘I Lips Drag’ Anniversary Tee on March 25th, that we’ve decided to recreate it in a fierce new black and pink color scheme that we are Gia Gunn absolutely in love with! This 100% cotton tee, made by American Apparel, is extremely soft and comfortable. Sizes range from XS to 2XL. Thank you to everyone who has bought a shirt recently from the Dragaholic Store! We’re working hard behind the scenes to bring you more great products, so stay tuned for even more great products coming soon. Want to see a certain product in the Dragaholic store? Tweet us your suggestions to @DragaholicNews!